James L. "Jim" Parkinson, age 60, of 305 Liberty Street, Bowerston, Ohio, died suddenly in his home on Friday, May 4, 2018. He was born January 27, 1958 in Barnesville, Ohio and was the son of the late Frank M. and Elizabeth Ann Cunard Parkinson. In addition to his parents, he was preceded in death by a granddaughter, Kylee Warner. Jim was an employee of the former COEN, Inc. at Sherrodsville where he worked as a grinder from 2006 until the shop closed. He had also previously worked as a district manager for Biketec, Inc. He was a 1976 graduate of Union Local Schools. An accomplished cook, he delighted in sharing photos of his creations on Facebook. 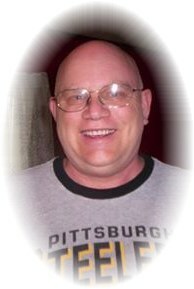 He appreciated music and was a knowledgeable fan of classic rock, and was a devoted fan of the Pittsburgh Steelers. Jim's favorite quote, which was strongly indicative of the way he lived was "Things don't matter ... People matter ...". He is survived by a daughter, Georgia Warner of Louisville, OH and a son Dan (Janell) Parkinson of Dellroy, OH, a brother John Parkinson of Belmont, OH, a sister Jane Lemoine of Alabama, and his four grandchildren Monica Brink and Ashlee Copeland, both of Dellroy, and Kayla Warner and Mason Warner, both of Louisville. A graveside service will be held at 1:00 P.M. Thursday, May 10, 2018 in the Richland Cemetery, 46515 Magee Road, St. Clairsville, Ohio with Rev. Milo Baker officiating. The Baxter-Gardner Funeral Home at Sherrodsville is handling arrangements. Memorial contributions in Jim's memory may be made to the Akron Children's Hospital One Perkins Square, Akron, Ohio 44308-1062 . To leave an online condolence message please visit the funeral home website.